Photos included in this posting were taken by Marc McGarraghy, whose work can be found on Facebook or the Yellow Mustang website. Thanks, as always, go to him for allowing me to use them. Opening proceedings tonight were Freaks + Geeks a relatively new York band made up of Stuart Allan, Sophie McDonnell and Loz Goodacre. I guess, with Stuart and Sophie also being half of The Blueprints, you could class Freaks + Geeks as a “spin-off” band, but the latter’s sound isn’t the jangly indie-pop of former. There’s something about it that’s a bit more dirty? Edgy? Punky? They opened with a short, sharp burst of a song whose lyrics are vaguely reminiscent of Blondie, and followed it with the longer Go Outside. This was only their second gig, but pedigree was showing and, even if the style is different, the playing was tight. The next track featured Stuart playing choppy, Jam-like guitar with a fast and furious middle section before Patchwork slowed things down and, with its dual, contrasting vocals, provided the most interesting song of the set. Bottle Green saw Stuart nonchalantly (or perhaps carefully, given the length of his shoes) pressing effects pedals, while Loz played the drums so hard that those of us at the front could feel our trouser legs twitching. A Little Longer had a more pop-py feel to it, making it the most Blueprints-like song of the set. Sophie joked that the final song, Pulp, wasn’t about orange juice which led to a bit of banter between her and Stuart, showing a kind of chemistry that only comes from two people who know each other very well. It was an entertaining set, even if the music is a little outside my comfort zone. Is it possible that a band can be, for want of a better word, hyped so much that when you finally get to see them your expectations are so high that you can only be disappointed? I hope so, because I think that’s what happened tonight when I saw A Joker’s Rage. Two of my gig-buddies had just about stopped short of pronouncing the band the best thing since slice bread. One knew vocalist Zak Taylor personally, introducing me to him before the gig started and announcing that I would be reviewing them. No pressure, then… The band have a gimmick – they perform made up to look like the Joker (of the “Batman’s nemesis” variety) and the smart, for a rock band, shirt-and-tie look only adds to the image. From the start it was obvious that Zak is a great showman. He pretty much owned the stage but, from where I was standing, despite being able to see the power he was putting into them, his vocals were lost behind the screaming guitars of Adam Gauton and Phil Morfitt. There was obviously a fair few fans in the audience and they responded with shouts of “Rage” every time Zak cried out, “A Joker’s what?” before the band launched into Screaming With The Lights Out. 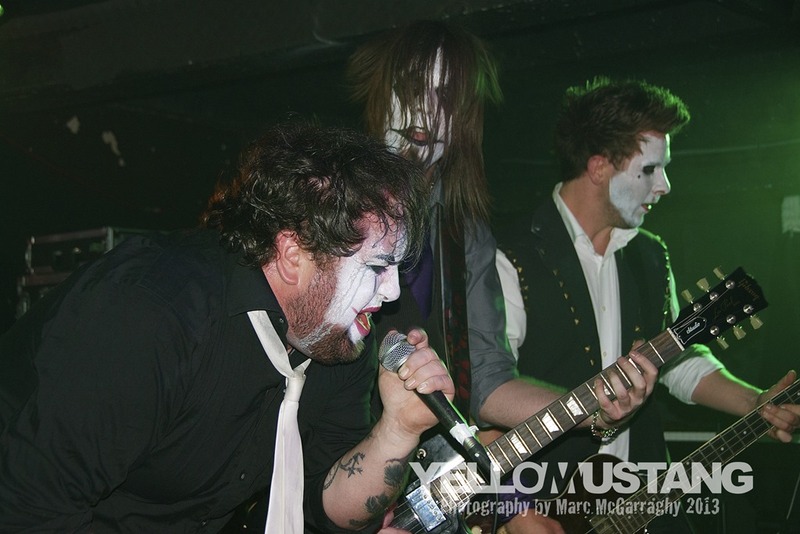 It was a high energy performance and already, just two songs in, the frontman’s makeup was running. The next song featured pounding guitars – I don’t think I’ve come across that sound before. “Get your kit off!” came a shout from the crowd and Zak shrugged off the suggestion, asking the audience, “Do you know how good looking James Toseland is?” He left the stage to go in search of a hat, passing his mic to Phil who took advantage with a lively “Oooooh yeah!” As the set went on the vocals had been getting clearer and, if anything, the band’s energy levels higher. There was, by necessity a lot of untangling of guitar leads and, towards the end of the set, some of the makeup was looking a bit more on the horrific side. Epiphany led into the final song of the set, a cover of Dr Dre’s California Love which, quite frankly, rocked Fibbers so hard that it was in danger of needing a new roof. As I said, my expectations had been built up and, while I enjoyed this set, I wasn’t as blown away by it as I think some people were expecting me to be. In a way Zak’s energetic performance detracted from the rest of the band and I find that I made very few notes about them. Maybe next time (and hopefully there will be a next time) I’ll try to pay more attention. Like a lot of gigs I go to, I had heard the name of tonight’s headliner. Unlike every other gig, though, I didn’t know him through music. 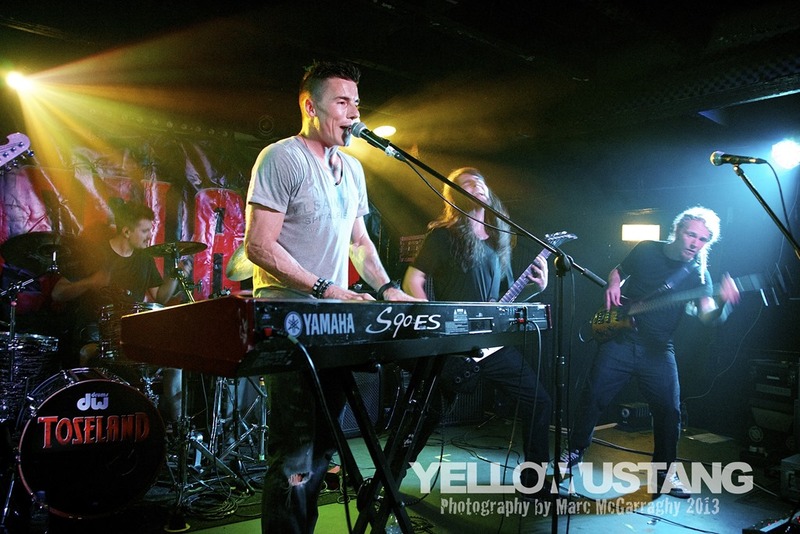 The first I had heard of James Toseland, former world Superbike champion, as a musician was when Toby Jepson mentioned that he had been working with him when Jepson played York earlier in the year. Curiosity got the better of me and I found myself at the front of a Fibbers crowd that contained more than the average number of sports fans. The band arrived on stage after a rendition of the Wasted Youth “guitar story” (from Bat Out Of Hell II). Pounding drums provided a backdrop to Toseland himself coming on to a huge cheer. He flashed a huge smile, asked how we were doing and launched straight into Burning The System. It was a high energy start which led straight into Gotta Be A Better Way and, from the off, it was obvious that Toseland possesses a huge amount of charisma. A roadie picked his time to sprint across the stage as a shout of, “get back on the bike” came from the crowd. “I wish I could,” grins Toseland, as he showed that his previously injured wrist no longer bends far enough. “If I could bend this wrist, I would. I can’t, so I rock!” Was the third song too early to get the crowd involved in a clap-along? Apparently not. “That was called Singer In A Band,” proclaims Toseland at the end of it. “No sh*t!” came from a member of the audience, who had spotted the obvious lyric, earning him a handclasp and us the story of Toseland being asked to sign an audience member’s knickers in Hull. “I don’t know why I said ‘it depends on how wet they are’,” he quipped. Emergency followed and then a bit of banter. “There’s two men fondling me organ,” he grinned as his keyboards are brought on stage. One of those two men was Toby Jepson himself, a roadie for the night and writer of the next song, the ballad Just No Way. There was no sound from the keyboard and a roadie scurried on again, prompting another grin from Toseland when they started working. It might have been a ballad but there was a huge sound from the keyboards at the end and then there was the huge, hard rocker Renegade. Kingdom saw him still on keyboards (and still with a nice line of slightly smutty humour between songs) and then he said, “Bye bye darling,” as they were removed and he returned to vocals only for Comin To Get Ya’. There was more gentle heckling and something suggested a proper small rock club atmosphere that is sometimes missing at Fibbers. Toseland was taking it all in his stride and nothing was putting him off his stride. Crash Landing and Good Eye Blind led into the current single, Life Is Beautiful, which had been getting airplay on Planet Rock and Kerrang Radio. “This has been the best gig yet,” proclaims Toseland just before he left a stage which was, by this time, strewn with water bottles. There was obviously going to be an encore because, with the band off-stage, the keyboards were brought back on and the mic stand replaced with a more adjustable one. After a while, Jepson had to run across the stage to remind the band to come back out for a cover version of Saturday Night’s Alright (For Fighting) which was a great track to showcase Toseland’s keyboard playing while still in keeping with the rock theme. At the end of the song the keyboards are removed again (Jepson is certainly earning his money tonight…) and the evening ends with a superb version of Queen’s Tie Your Mother Down. Despite the adulation from the crowd, Toseland appeared very humble. There was something about his performance that showed that he knew he was a star, but also a newcomer. It was obvious that music is more than a hobby. He played on his obvious strengths (looks, charisma and talent) but also took time to acknowledge the members of his band. Toseland is a fantastic rock vocalist and his band is comprised of top class musicians, who he obviously respects. This was no novelty act and there was no hint of an over-inflated ego. This entry was posted in Live Music and tagged A Joker's Rage, Freaks + Geeks, Toseland. Bookmark the permalink.